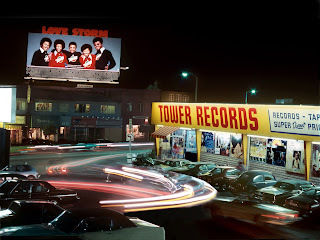 Directed by Colin Hanks and written by Steven Leckart, All Things Must Pass: The Rise and Fall of Tower Records is a documentary film about the record store chain that had made more than a billion dollars by the end of the 20th Century only to file for bankruptcy five years later. The film showcases how a little record shop from the 1960s in Sacramento went to be not just some record store but a place where its employees worked and had fun there. The result is a fascinating and touching film from Colin Hanks. For anyone who used to buy music at a music store, it was quite obvious that Tower Records was the place where music fans would go to not because it was the place where they sold all kinds of music but offered so much more. It was a place where music fans could talk to each other about music as well as find imports, albums that aren’t sold at other music chains, and meet people who loved working at this place. Then all of a sudden in the mid-2000s, it was gone as the culture itself not only lost a big part itself but also a world that might not exist again in such a big way. Especially as retail chains sell music but also sell other things at a certain price and it doesn’t have a sense of community that Tower Records was about. The film that Colin Hanks and writer Steven Leckart make isn’t about the chain’s fall but also how it began as this little store Russell Solomon ran next to his father’s drug store which was next to the Tower Theatre in Sacramento and it became a chain that unexpectedly became big. Especially in the people that Solomon would come across throughout the years including his son Michael, a few cousins, and such would be part of the store either as clerks or small-time employees who would later manage or be part of Solomon’s close circle. The people who worked in the store didn’t just treat their job with great care but also had a sense of joy in their job. Especially as they would party and travel as well as take risks to make the store into a big-time chain as well as launch one in a country like Japan which turned out to be a successful gamble. The film also feature interviews with musicians such as Bruce Springsteen, Dave Grohl, and Elton John as well as music executives David Geffen and Bob Urie who all sing the praises of the story. Urie, in particular, who shares a personal story of how generous Solomon was to him at a time when Urie was fired from his job and Solomon invited him to a Xmas party and later dinner. John talks about going to Tower Records at its famed Sunset Strip spot where he would buy records whenever he’s not on tour and be there once it opened. Solomon and several people who worked at Tower talked about the joy as well as what made the place so special including a mantra made by the Japanese chain which was No Music, No Life. While its fall can definitely be attributed to the emergence and rise of Napster in 2000 where music was free. Solomon and several others at Tower reveal that it was a lot more than that as they also contributed to their own downfall in some respects such as not selling CD singles in favor of albums in the late 90s which they admitted was a mistake. Another issue that plagued the company was trying to have the place in markets such as South America where they didn’t understand the culture as the stores there didn’t make money. Along with price wars between large retail chains such as Target, Best Buy, and Wal-Mart and management issues that involved Solomon’s son Michael to briefly take over for his then-ailing father. Eventually, the company’s death knell came in the hands of outsiders who were more interesting in branding and restructuring the company only for it to go out of business for good. Hanks’ direction is quite straightforward in the way he conducts the interviews with the aid of cinematographers Neil Lisk, Nicola Marsh, and Bridger Nielson as well as compile old footage and photos with editor Darrin Roberts. The film also features sound bits compiled by sound editor Richard B. Larimore that includes an audio clip of John Lennon telling Californians to buy his new album at the store. The film’s music by Bill Sherman is wonderful for its mixture of jazz and rock to play into the world of music as the soundtrack features an array of different music styles to play into the progression of popular music in the 20th Century. All Things Must Pass: The Rise and Fall of Tower Records is a sensational film from Colin Hanks. It’s a film that doesn’t just explore one of the finest record chains in the world but also the people who worked and ran the chain as they did it with love for the music and love for the work. Especially as it showcases a culture that was vibrant and brought people together all because they love music. In the end, All Things Must Pass: The Rise and Fall of Tower Records is a phenomenal film from Colin Hanks. I've never been to a Tower Records. My memories of buying music at stores was always Sam Goody and some other one that I can't seem to remember now. I'd like to see this doc, I watched a few interviews from Colin Hanks about it and he was so enthusiastic. I can't help but like that guy. I'm glad you liked this film. I have to see this. I used to spend hours in Tower and other record stores just browsing. Usually I wound up buying a couple CDs before leaving. I'm waiting for a similar doc about Blockbuster. @Brittani-Was it Camelot? FYE? I used to shop at those places and at Sam Goody's. Those were the days. I bought nearly most of NIN CDs there back then as well as the used record store that was nearby as I hung out at that place for years until it closed down. I still miss the record/DVD store. @Wendell-I live for the record store. Browsing was a past time of mine I used to enjoy and I just love hanging out there. Sometimes, if I had money, I would buy some stuff as I've had a Tower Records here near Buckhead in Atlanta. The last thing I think I bought was Chris Bell's I Am the Cosmos. They had everything there. I still prefer the physical product rather than the digital. It doesn't feel the same seeing your music collection in a iTunes or something.